New home technology products and excellent services from home industry professionals are driving the TecHome dream forward, fundamentally improving the way Americans live. 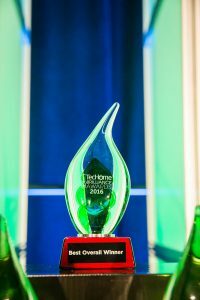 The TecHome Brilliance Awards will recognize the leaders with powerful promotions and publicity to both trade and homebuyer audiences. Program entrants and winners receive substantial publicity on techomebuilder.com and techomebuildersummit.com. They also benefit from exposure to the TecHome Universe of 60,000+ contacts. The value of promotional exposure for entrants far exceeds the cost and time of entering. For winners, who receive extra recognition and are enabled to self-promote their win, value is extraordinary.